Sometimes I mess with my kids. Just a little bit. They always think it's funny. Usually when I move the kids up in size of clothing, I just do it all at once. I take all the old clothes out of the closet, then grab my stash of the next size up, and restock the closet. It takes a couple of hours to do all this, but I think it's easier than doing it in bits and pieces. Last time I was doing this, and the floor was completely covered in clothes, Pierce happened to walk in the room. I looked at him and said, "Pierce! Why did you make this huge mess in your room?!" His eyes got really wide and he looked shocked. His jaw dropped. I smiled. Then he realized I was messing with him. He started cracking up. He loves it when I mess with him, once he figures it out. Readers, do you mind when you get teased? How cute! We are a family of teasers. Now that Little Lewie is a little older, I find that he enjoys teasing us right back. (By the way...you're smart to change all the kids' clothes at once. I decided to do the very same thing; although we had unexpected temperatures that reached the 80's, so I found myself going back to our summer bins in the attic. Maybe I need to wait until after Sept. to do the clothes "change-over." I can just hear him giggling once he realized you were teasing! John often teases me so I am used to it! I don't mind being teased but there are some who don't seem to have any concept about the whole thing and get upset. I remember my daughter used to get mad when we teased her. She was not a fan of that! You sound like a fun mom! Lots of stuff, I watched my daughter clear out lots this last week. She passed the wrong bag on. too cute! and sweet, too. Oh yeah, it's a good thing none of us mind being teased here. I Don't mind at all being teased. I'm sort of gullible, so people have fun messing with me as well. Great post! You are a VERY cool mom! We have to have fun with our kids and not just be the rule maker all the time. It sounds like your kids have a great sense of humor. op z,on manier niet hoor. We only communicate through teasing and sarcasm around here! I used to volunteer as a reading coach in the grade school when my kids were there. The little ones always took a long time to realize that I was joking with them--I don't think the adults in their lives did that. Once they figured it out, we'd have a blast. It depends. Some people use teasing as a way to bother someone, perhaps out of anger or insecurity. That's annoying. Its good to tease. I tease my mom all the time! 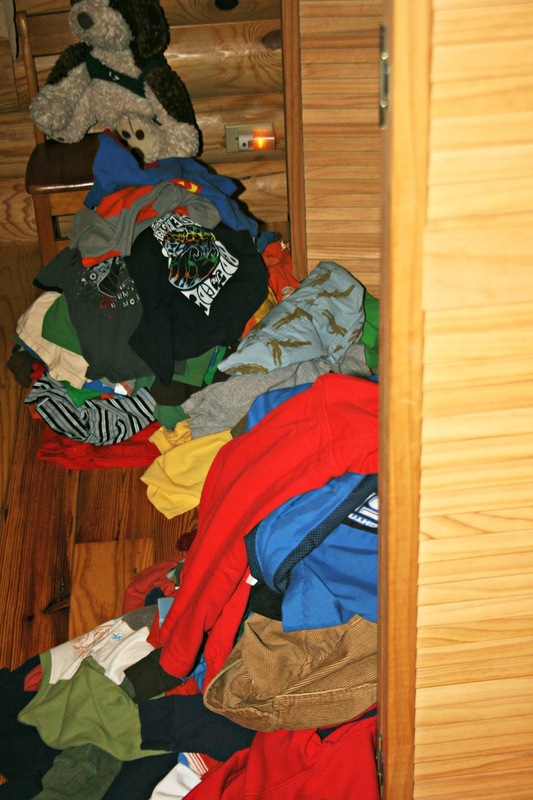 I try to take out the clothes that my son outgrows as he says they don't fit anymore so they won't be taking up room in the closet and he won't accidentally grab them out again. Before school started I went through his clothes and took out a lot of things that he outgrew over the summer. They grow up way too fast! Hum, nobody has teased me in many years, so I don't really remember if it bothers me. That is cool you can tease with him like that! You have a big job there. so, thanks for this little tip. LOL! That is a colorful closet! Try this one sometime - say one of the boys name in a stern voice like they may be in trouble and when they ask "what" say " I love you ". Gets them everytime. The stories I could tell about the pranks my dad pulled on me. Wish they were as innocent as this. I know I've said this a hundred times, but you're such a good mom. Your boys are blessed. No, I love laughter and I agree with your plan. Best to get it all done with at once! I don't mind getting teased if it is something like you did and not hurtful to my feelings.